This episode of Just One More Book!! is dedicated to the memory of a good friend, Marcel Boudreau, a man who not only knew how to live a happy life, but helped others understand how to live their own happy lives. He made this a better world. We miss you, Marcel. Life is sweet and short and moves so fast, sometimes we need a cheeky little book like this to remind us to stop to live and love our lives. You can find the lyrics for “Everybody’s Free (to wear sunscreen)”, by Baz Lurhman, here. If you’ve ever wondered what’s going on in the mind of a yipping, sniffing, hustling, jumping, manic terrier — wonder no more! This classically simple, hilarious book tells all. Can you guess who made this Love of Reading illustration? We continue to receive fantastic illustrations for our Love of Reading Gallery, and have even spied a sneak preview of a work in progress by one illustrator. Yesterday, we were surprised when we received the illustration that appears at the right of this post. Can you guess who created it? Don’t forget to stop in to our Love of Reading Gallery to see the great artwork that’s on display for everyone to enjoy. Stunningly warm, intimate illustrations and eleven candid first person accounts capture the crescendo of Lady Liberty’s creation, from idea to unveiling, and give us an enduring appreciation for the landmark, her creators and the many lives she has touched. We generally expect children’s books to educate and entertain children. It’s a special book that inspires a child to experiment and explore the world around them. It takes an author that conducted experiments during their own childhood, experiments like measuring the length of a frog and the distance of its hop to figure out how far a human with frog legs could hop. It takes an author that’s willing to count and pop one hundred thousand kernels of popcorn to demonstrate big numbers. Our guest on this edition of Just One More Book!! is David Schwartz, author of fifty books including How Much is a Million — which inspired our two daughters to count to five hundred during a walk prior to this interview — and Cybils non-fiction finalist Where in the Wild. 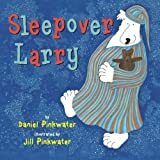 Grease your muffin tins and defrost your blueberries, it’s time for another adventure in friendship and frivolity as two thrillingly familiar polar bears let the good times roll at Larry’s first ever sleepover. We have been receiving submissions for our Love of Reading illustration event — a part of our 2nd anniversary/400th episode celebrations that will take place in July. …so that everyone can enjoy the great illustrations. Illustrators of all backgrounds are invited to submit a logo-like illustration that can be resized nicely and featured on our website for everyone to enjoy. Illustrators submitting artwork will be invited to be guests of Just One More Book!! to talk about their design, the creative process and how their submission helps to promote a love of reading.We ask that all submissions be emailed to justonemorebook@gmail.com in JPG, PNG or GIF format, 500Ã—500 pixels on or before June 15, 2008. Let us know if you have any questions. A spunky free-ranging guinea pig hero, an equally lovable, gullible villain and the happy mash-up of several familiar folk tales make this gorgeously illustrated trickster tale a story worth repeated re-enactment in the schoolyard with friends (really!). We discovered yesterday that we’ve become finalists for the 2007 Best of the Blogs: Podcasting category. How Nice! Thanks to Susan at Chicken Spaghetti, who nominated us in the first place, and to any of you who happened to have voted for us during the first round! If you feel like voicing your opinion, you can vote here. And you can voice your support for the most deserving Chicken Spaghetti here. Rich, imaginative illustrations and generous, poetic text present an endearing fantasy that leaves us pondering issues of identity, purpose, contentment, control and choice. You can peek inside this book, here. 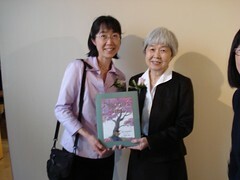 On May 8, 2008, The Japan Foundation in Toronto, Canada, hosted the launch of Naomi’s Tree, a picture book about friendship written by Joy Kogawa and illustrated by Ruth Ohi. It was a fascinating event that included a display of the real sketches and final artwork for the book. We were there with our audio recorder running. We captured Joy Kogawa’s introduction of the book and Ruth Ohi’s explanation of the illustration process and then a demonstration of her technique. On this edition of Just One More Book! !, excerpts of the book launch event and an interview with Joy Kogawa and Ruth Ohi. Thank you very much to Ken Bole, President of The Canada Japan Society, for making us aware of this event.